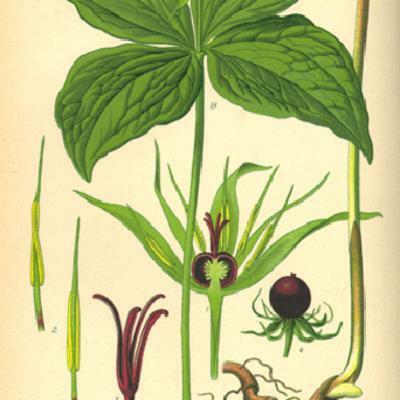 The scientific and common names for herb paris are derived from the Latin par, meaning pair, referring to the symmetry of the pairs of leaves and floral parts (not the city Paris, as has commonly been assumed and the reason why paris is sometimes capitalised in its common name) and quadrifolia meaning four leaves. The leaves are positioned in opposed pairs, and the flowers are wispy and inconspicuous and have a crown of golden-yellow stamens, making Paris quadrifolia a distinctive woodland plant. The native range of Paris quadrifolia comprises the boreal and temperate areas of Europe and extends eastwards to western Asia, western Siberia and the Himalaya. Overview: A perennial woodland herb, 25-40 cm tall, with a rhizome (underground stem). Leaves: Four (often 3-8) deep green leaves, broadly obovate, measuring 6.0-10.0 × 2.0-5.5 cm. The leaves are in a single whorl at the top of the stem and are stalkless or with only a short stalk. Flowers: Four broad green sepals and four narrow yellow-green petals, topped with a crown of 8 (sometimes up to 12) golden-yellow stamens. The ovary has four chambers and four protruding styles. Fruits: Black, spherical berry, approximately 13 mm in diameter, containing on average 34 seeds. Seeds: Dark brown, egg-shaped, 2.5×1.5 mm. The common name 'herba paris' was first used in 1544 by Italian botanist Pierandrea Matthioli in his Italian edition of commentaries on Dioscorides' Materia Medica . 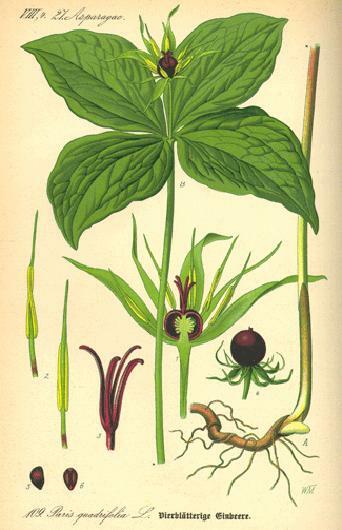 Herb paris also appears in Gerard's Herbal of 1636 as an antidote to highly toxic substances such as arsenic or mercury. Other common names allude to its black berry (devil-in-a-bush) or to its connections with love - the four leaves are paired like lovers and also bear a resemblance to the loops of the true lover's knot. Paris quadrifolia is in decline in Europe due to a reduction in broadleaved woodland, its primary habitat. Native woodland is frequently cleared to make way for conifer plantations and construction of new roads and buildings, and although this is often mitigated by the planting of new woodlands, herb paris has limited dispersal abilities and is slow to colonise new areas. The conservation of ancient broadleaved woodland is therefore key to preventing further decline of the species. 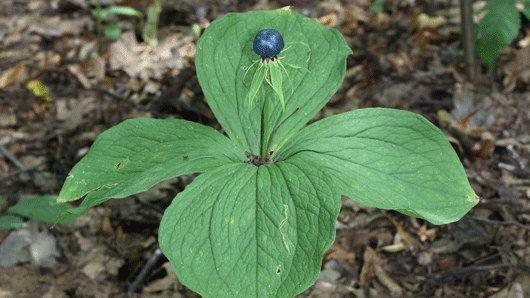 Paris quadrifolia has a large quantity of DNA in its cells (with a 2C DNA value of 60 picograms) but scientists at Kew's Jodrell Laboratory recently discovered that the related species Paris japonica has the largest genome on record, with well over twice this amount, at a staggering 152 picograms. Paris quadrifolia is cultivated as an ornamental and makes an attractive addition to a woodland garden. Its medicinal use is almost exclusively confined to homeopathy. Two collections of Paris quadrifolia seeds are held in Kew's Millennium Seed Bank based at Wakehurst in West Sussex. 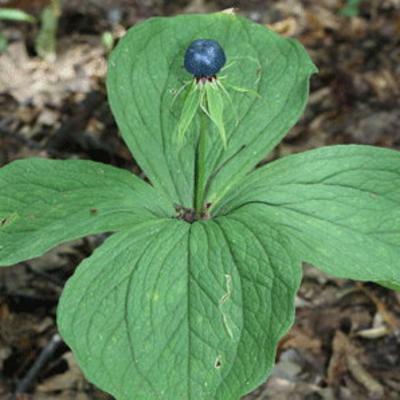 Herb paris requires a neutral or only slightly acidic soil that is deep, moist, well drained and humus-rich. It will do best in a partly shaded position where the soil stays moist throughout the year. It spreads vegetatively by rhizomes, which can be divided to propagate the plant. Alternatively, seed can be collected and sown in containers immediately after harvesting. Herb paris can be seen growing in Kew's Woodland Garden (at the southern end of the Plant Family Beds). 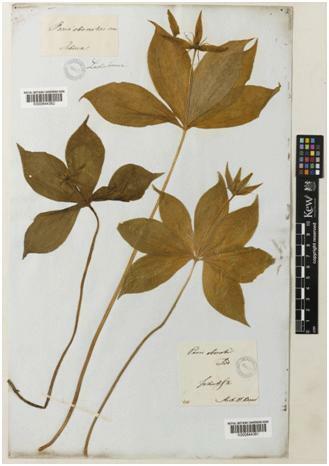 Dried and alcohol-preserved specimens of Paris quadrifolia are held in Kew's Herbarium, where they are available to researchers by appointment. Further details, including images, are available online in Kew's Herbarium Catalogue. Moist woodland and other damp, shady places, on calcareous soils. Not assessed at an international level; Least Concern in the UK, according to IUCN Red List criteria. All parts are poisonous; ingestion can induce diarrhoea, headache, nausea, vomiting, stomach ache and vertigo. Alpine Garden Society (2012). Plant Portraits: Paris quadrifolia. Biological Records Centre (BRC) (2012). Online Atlas of the British and Irish Flora: Paris quadrifolia. 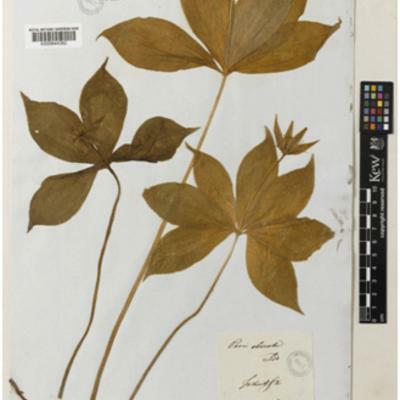 Available at: http://www.brc.ac.uk/plantatlas/index.php?q=plant/paris-quadrifolia (accessed 10 December 2012). IUCN (2012). IUCN Red List of Threatened Species. Version 2012.2. < www.iucnredlist.org> (accessed 10 December 2012). JNCC (Joint Nature Conservation Committee) (2012). The Vascular Plant Red Data List for Great Britain: Conservation Designations for UK Taxa. Stace, C. (2010). New Flora of the British Isles, 3rd Edition. Cambridge University Press, Cambridge. The Plant List (2010). Paris quadrifolia. Angiosperm Phylogeny Group (2009). An update of the Angiosperm Phylogeny Group classification for the orders and families of flowering plants: APG III. Botanical Journal of the Linnean Society 161: 105–121. Chase, M. W. & Reveal, J. L. (2009). A phylogenetic classification of the land plants to accompany APG III. Botanical Journal of the Linnean Society 161: 122–127. Gledhill, D. (2008). The Names of Plants, 4th Edition. Cambridge University Press, Cambridge. Jacquemyn, H., Brys, R. & Hutchings, M. J. (2008). Biological Flora of the British Isles: Paris quadrifolia L. Journal of Ecology 96: 833–844. Mabberley, D. J. (2008). Mabberley’s Plant-book: a Portable Dictionary of Plants, their Classification and Uses, 3rd Edition. Cambridge University Press, Cambridge. Davies, D. (1995). Enwau Cymraeg ar Blanhigio: Welsh Names of Plants. National Museums and Galleries of Wales. Tutin, T. G., Heywood, V. H., Burges, N. A., Moore, D. M., Valentine, D. H., Walters, S. M & Webb, P. A. (1980). Flora Europaea, Volume 5 Alismataceae to Orchidaceae (Monocotyledones). Cambridge University Press, Cambridge. Botanical Society of the British Isles (BSBI). Maps Scheme.